In early times most towns would have a Flesh Shambles, a name probably derived from the Anglo-Saxon fleshammels, literally meaning 'flesh-shelves', the word for the shelves that butchers used to display their meat. Consequently 'Shambles' was an early term for an open-air slaughterhouse and meat market. 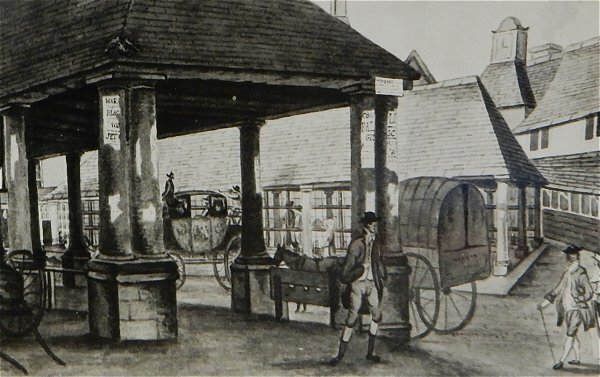 In the Borough there had been a shambles, the stalls in the public market where the meat was sold, since at least 1364. In this year was an action at law in which the Rector claimed that the land on which the shambles stood was part of the Rectory and he was therefore due its weekly tolls - the butchers each paid a penny a day for using the shambles. However the people of Yeovil claimed the land was part of the highway, in other words common land, for which no tolls were due. The Rector, Robert de Sambourne, also a Canon of Wells, produced a document signed by King Edward III (reigned 1327-1377) confirming his right to claim the fees from the shambles as well as his right to hold a weekly market each Friday "as having existed through the time of his predecessors beyond the memory of man." It was claimed that the Rector had obtained the document by underhand means. As a consequence the King's Escheator, an officer of the King's appointed to ensure that the King got all his due fees, seized the shambles in the name of the King claiming that the land in dispute was part of the "Royal Road" that is, part of the King's Highway. Robert de Sambourne appeared in person at the Chancery in Westminster to plead his case. He argued that as Rector and Lord of the Manor by right of his church, he held a market in the town every week. He also claimed that the waste land of the town belonged to the Rector and that the market stalls had been fixed on the land in question - 7 feet in breadth and 27 feet in length - by the bailiffs and men of the Parson of the Church "before the time of memory". The matter was not settled at Chancery but referred to the local court at Ilchester. Robert de Sambourne won his case as it was determined that the Rector and all his predecessors held the lordship of the town, the rights to the market and the land in question. Further, the Escheator was ordered to return all the confiscated fees he had collected. 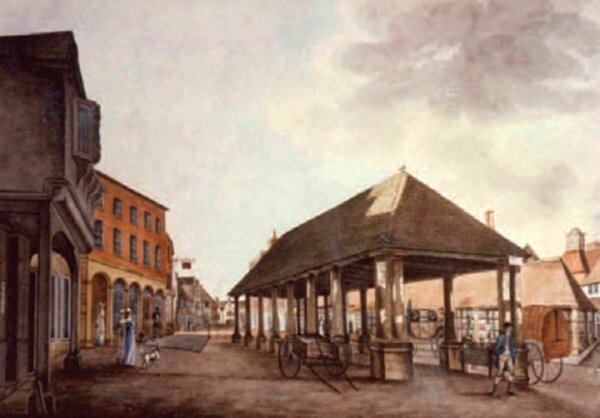 By the eighteenth century there had been a Market House in High Street for generations and was described as follows "It is 70 feet long and 20 feet wide, supported by 20 stone pillars, and in the middle of it are the remains of an ancient cross; there are also several rows of shambles." The nineteenth century building known as the Shambles was a timbered market building with a tiled roof situated in the Borough in the approximate location of the war memorial and bus stops of today's Borough. It was built in 1803 by butcher George Watts and served for nearly a century and half. It was sometimes called the Butchers' Shambles because it was used exclusively by the purveyors of meat. By the middle of the nineteenth century the Shambles, as well as the adjacent Market House, had fallen into disrepair and their demolition was the subject at the first meeting of the newly set up Special Commissioners in 1846. Both the Shambles and the Market House were demolished in 1850 with the Special Commissioners contributing £200 towards the costs. 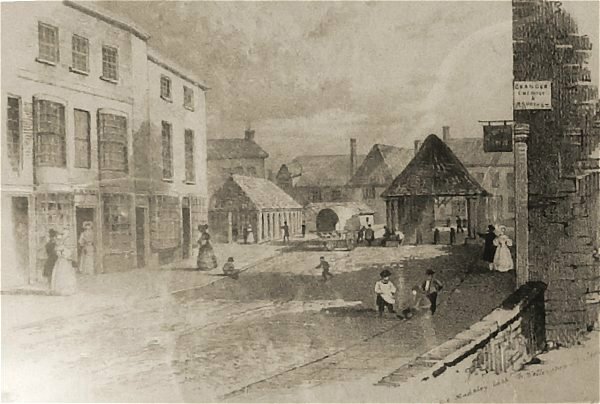 A painting made in 1810 of the Borough looking towards High Street which runs to the distance at left. The building at centre was the Market House, built in 1740, and behind it to the right was the butcher's Shambles, built in 1803. The Tolle Hall is seen at right, surmounted by its clock or 'horolitch'. At left, the building with the arched ground floor is the only building surviving today in the Borough and originally the ironmongery shop of William Edwards, then Josiah Hannam followed by James Bazeley Petter and then Hill & Sawtell. Today it is 15 High Street, occupied by Superdrug and is seen in the final photograph of this page. At extreme left is the ancient building, called The Bow (see next image) on the corner of today's Wine Street. Note, in the far right corner of the Shambles, the stocks - used for humiliating public punishment of minor offences. 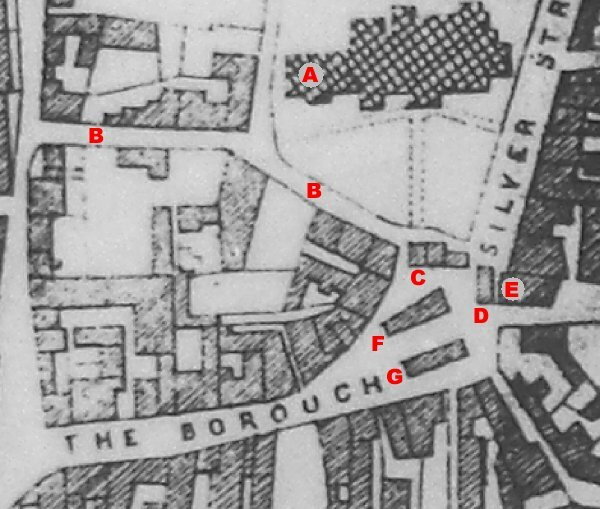 An enlargement of the previous image showing more clearly the Butchers' Shambles situated behind the Market House. This sketch, made by GE Madeley to illustrate his map of 1831, shows the Borough seen from High Street - roughly the view seen today from the north end of King George Street. The Shambles is to the left and the Market House is to the right. The buildings at far left still stand today, that to the left is Clement White's shop, today's 8 High Street, at this time occupied by draper Benjamin Ryall whose name appears above the door. Behind the hanging sign at right is the Medical Hall which at this time was occupied by George Wellington, druggist and chemist.